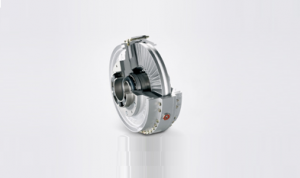 The FLUDEX coupling is a fluid coupling on which the coupling parts on the input and output side are not mechanically connected and thus resistant to wear. FLUDEX couplings limit the starting and the maximum torque in the drive train and serve as starting aid for the motor, as overload protection in case of malfunction, and for torsional vibration separation. Four series of FLUDEX couplings are offered with various types and sizes designed according to the modular construction system and for power ratings up to 2,500 kW. Fludex couplings are hydrodynamic fluid couplings which operate on the Fottinger principle. The coupling parts on the input and output sides are not mechanically connected to each other. Output is transmitted via the oil filling which rotates in the coupling and is conducted over radially arranged blades. Fludex couplings limit starting and maximum torque in the drivetrain and, through the property of rotational slip, serve as an aid to starting the motor, as overload protection in the event of fault and for isolating torsional vibration.